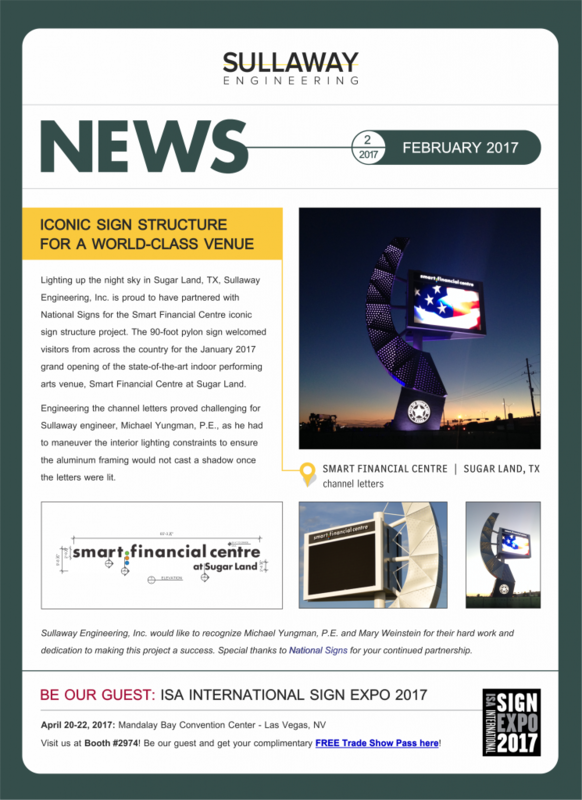 Lighting up the night sky in Sugar Land, TX, Sullaway Engineering, Inc. is proud to have partnered with National Signs for the Smart Financial Centre iconic sign structure project. The 90-foot pylon sign welcomed visitors from across the country for the January 2017 grand opening of the state-of-the-art indoor performing arts venue, Smart Financial Centre at Sugar Land. Engineering the channel letters proved challenging for Sullaway engineer, Michael Yungman, P.E., as he had to maneuver the interior lighting constraints to ensure the aluminum framing would not cast a shadow once the letters were lit…continue reading in your web browser or view the PDF file by clicking the link below.